Less than a month before the midterm elections, a man who has admitted to being a proud non-reader of books and nonvoter met with Donald Trump at the White House. Yep, after faithfully stroking the President's ego, Kanye West finally got his narcissistic wish. The meeting between Trump and Kanye was high-octane foolishness and one of many debasing moments in Trump's circus-like White House. As people are fighting for their lives while enduring Hurricane Michael, which should have been the focus this week, we instead have two fame-obsessed, thin-skinned celebrities gushing over each other. There are claims that Trump is exploiting Kanye West, who has admitted to having mental health issues, by inviting the press to witness his gesticulating and f-bomb throwing in the Oval Office. While Trump is known for exploiting any and everything -- even the September 11th terrorist attacks -- Kanye West is no victim. Moreover, it is wildly offensive to conflate having mental health issues and displaying erratic behavior with being a willfully ignorant man-child, which is what Kanye West has become. Mental health struggles have nothing to with one's political beliefs. In addition, a black celebrity worshipping a raging bigot is nothing new -- simply revisit Sammy Davis Jr.'s history with President Richard Nixon. Yeezy is no victim and should not be empathized with as one. This is a person who claimed Malcolm X wasn't relatable, said Harriet Tubman shouldn't be on the $20 bill, and compared himself to Nat Turner. The true victims are thousands of children who were torn away from their parents at the border and confined to penned areas. The victims are the black and brown people who will once again see an unconstitutional abuse of power if stop-and-frisk is reinstated and expanded, as Trump has expressed the desire to do. The victims are women who are not believed when they come forward with sexual assault, but are mocked -- even by their President. In one of the many awkward moments from Kanye's ten-minute monologue in the Oval Office, the "Gold Digger" rapper defended his "Make America Great Again" hat. He claimed the red accessory gives him "power" and people tried to "scare" him into not wearing the hat. Hate certainly has power, which is a concept West apparently doesn't understand in his quest to feel like Superman. Imagine if Germany had a slogan called "Make Germany Great Again" or a South African politician ranted "Make South Africa Great Again." There would be rightful outrage. "Make America Great Again" is a coded version of "no coloreds allowed" signs. Trump fashioned the phrase to his purposes as a dog whistle to the worst part of his base. But Kanye doesn't love or respect his identity enough to do his history. As Donna Brazile said on Twitter, Kanye "set us back 155 years." If Kanye were a 41-year-old black man living on the south side of Chicago, he wouldn't co-sign "Make America Great Again." His bubble of fame, money, privilege and soaking in the Calabasas air with the Kardashian clan has afforded him the privilege to be proudly ignorant. He is largely immune to Trump's dangerous policies. 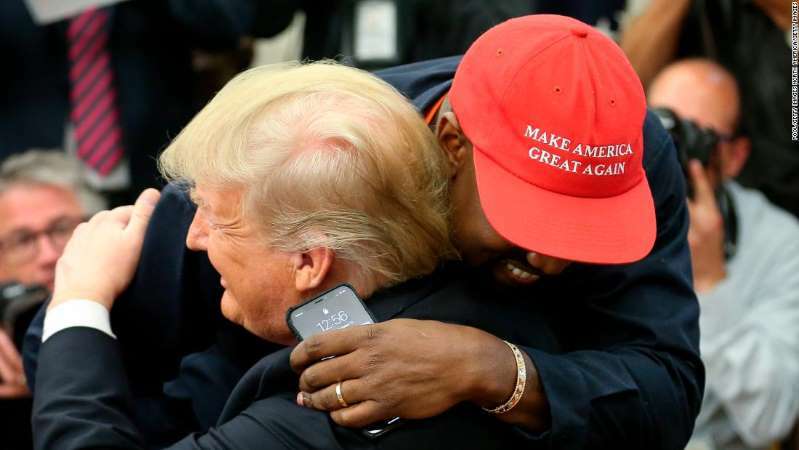 When it comes to Kanye meeting with Trump to discuss "the blacks" -- Kanye, we don't need you. No one needs you. We need resources, not an imaginary hero. Remember, the rapper has become a multimillionaire by creating art from black culture, but his behavior signals he clearly does not respect the culture in his "Make America Great Again" hat and "slavery is a choice" rants. Most importantly, if you are a rich, privileged celebrity who isn't affected by the consequences of not voting, yours isn't the voice we need trying to speak truth to power. Therefore, if you have any doubts about voting, let the image of Kanye jumping into the arms of the President in the Oval Office while people are suffering through a hurricane inspire you to get out and vote. Because Trump is about to morph into a Category 5 if the so-called blue wave doesn't sweep through on November 6.